The 2019 season saw the Arena Slotstox Club have two regular venues: the first and third Wednesday of each month at the Waltham Abbey Community Centre ('WACC') and second, fourth and fifth Wednesday of each month at the new Hobbs Cross venue. 3 April - Arena points chart round 1 at 'WACC' – the first official Slotstox meeting at Arena since 2016 and racing as Gold grade for the season having won the Gold Stripes as well as being defending Arena points champion from 2016. Nine Slotstox were made available - four of which were mine! Using my new Slotstox with Parmastox handcontroller - heats 50 points (heat 1 15, heat 2 13 and heat 3 22) and fifth highest points scorer of nine drivers with new drivers to Slotstox starting from white grade despite being much higher graded in Parmastox! Final with all drivers starting from their grades over 10 laps – 4th (8) to add 3 points chart points - a total of 53 points chart points. 6 March - Arena points chart round 1 at 'WACC' - heat 1 racing my blue Parmastox - 3rd of seven drivers (24 - 2nd scored 25 whilst 4th and 5th each scored 22); heat 2 - continuing with my blue Parmastox even though this had sustained chassis damage in heat 1 - 1st of seven drivers (46) and heat 3 - switching to my red Parmastox to give this a run - 6th of six drivers (9) as my red Parmastox lacked stability. All remaining drivers qualified for the final for which I switched back to my damaged blue Parmastox - 2nd of six drivers (34) - 12 (best heat 5 + final 7) points chart points. 13 March - Arena points chart round 2 and the first points round at 'Hobbs Cross'. With my blue Parmastox having had repair work, this wasn't available for practice so I practiced my red Parmastox which went rather well and noticing the crashing in practice I decided to use my red Parmastox rather than my more fragile blue Parmastox - heat 1 - 1st of six drivers (44) and heat 2 - 3rd of six drivers (23 - 2nd scored 25). My heat win meant I qualified for the final - 2nd of six drivers (27) - 12 (best heat 5 + final 7) points chart points. 20 March - Arena points chart round 3 and Gold Top Qualifying round 1 at 'WACC' racing my blue Parmastox - heat 1 2nd of seven drivers (26 - all very close as 3rd scored 25, 4th 24 and 5th 23); heat 2 - 4th of seven drivers (18 - with not much going right -5th also scored 18 but I had 3 second place finishes to their none) and heat 3 - continuing with my blue Parmastox and determined to win this heat - 1st of seven drivers (44 - finishing 11 of the 12 races). All remaining drivers qualified for the final - 2nd of six drivers (37 - 1st scored 38 and I would have won the final on 2nd place finishes had another driver not done an extra lap in the penultimate race promoting 1st up a place and the crucial point although my Parmastox did have braid issues in one race in black lane which equally was possibly costly) - 12 (best heat 5 + final 7) points chart points and Gold Top Qualifying Points. I was 2nd in the Gold Top Qualifying points after round 1. On 23rd March, I raced at the Wellgate Slotstox Club in Metal Mania VIII which doubled up as the Supreme Championship and BSA National Series round 1. As now standard for BSA Series rounds, drivers competed in three heats of two races per lane (four lanes at Wellgate) over 8 laps with points scored based on their finishing positions in each - 1st 6, 2nd 5, 3rd 4, 4th 3, 5th 3 and 6th onwards 1. There was a change for 2019 in terms of semi-final qualification - the highest points scoring eleven drivers would automatically qualify to the semi-finals whilst the next six would compete in a consolation heat with the winner to also qualify. Having practiced both my blue Parmastox and red Parmastox I decided to race my blue Parmastox as my red Parmastox felt less stable. Practice was not without incident as my blue Parmastox chassis side iron and hand controller each broke and needed re-soldering prior to the meeting! Repairs were carried out by Arena Chairman Jack Branch who had previously asked if his son Chris could borrow a Parmastox as his was not working - Chris being a regular racer in the past but not currently. I agreed that I would lend whichever of my Parmastox I didn’t race so Chris borrowed my red Parmastox chassis to which he fitted his own Parmastox metal body work and shell. Jack, Chris and I were drawn together in heat 1 but heat 2 was run first as Jack was still repairing my hand controller! Heat 1 5th (2 points) of six drivers (17 - 4th scored 18 whilst 2nd and 3rd scored 19), heat 2 4th (3) of five drivers (14) and heat 3 5th (2) of six drivers (5 - 6th scored 4). My heat point score of 7 was not enough to qualify for the semi-finals as I finished a lowly 28th out of 32 drivers. Three other drivers also scored 7 points but I had most raw points (36). With the scoring system as it is the driver that qualified seventh to the semi-finals only scored 2 points more (38) although the driver that qualified 8th had the second highest raw points (61)! As for Chris... he won the Championship! Having not originally planned to, I decided to race in a Grand National using my spare Parmastox chassis with Chris’s metal body work and shell i.e. the Parmastox as it was having come off the track after the final win. With the thought being that the lighter body was the difference, to me it still felt as it did with my red metal body work and body shell in practice and I failed to finish a race, scoring 0 points and finishing 4th of 4 drivers! Whilst not my day it did indicate that my spare Parmastox chassis was still competitive... just a case of finding what made the difference? 27 March - Arena points chart round 4 at 'Hobbs Cross'. The intention was to race and continue to test my red Parmastox chassis with Chris Branch’s metal body work and shell – which I had agreed to borrow – only swapping his wing for my shale wing. 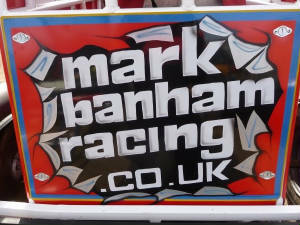 This was following its performance at Wellgate when used by Chris to win the championship! Practice confirmed that intention with this Parmastox set up more suited to the Hobbs Cross track than my blue Parmastox or my red Parmastox chassis with its usual metal body work and body shell. This proved a good decision for heat 1 (including winning the first two races!) - 1st of six drivers (41). I was also going well in heat 2 but in the third last race my Parmastox shot off the track at the end of the home straight all on its own – subsequently diagnosed as two detached engine screws which meant there was no way of it slowing down! For the last two races I used my blue Parmastox but in the first of these a big crash broke the metal body work and I had to nurse it to a finish in the final race of the heat – 2nd of six drivers (30 – the winner scored 34 so, without the issues, it may have been a different result but that’s racing!) My heat win meant I qualified for the final and with my red Parmastox chassis still missing an engine screw and with my blue Parmastox metal body work damaged, I raced my blue Parmastox chassis with the metal body work and shell of Chris Branch – whilst not the quickest set up, consistent finishes provided decisive - 1st of six drivers (38 – only 1 win but finishing 11 of the 12 races) – first final win and maximum 13 (best heat 5 + final 8) points chart points of the season. During the first 4 rounds points/grades cycle I was the highest points scorer on 49 points with the highest average 12.3 points. Being the Arena Silver Top Champion my grade for the season would not change. 13 March - Arena points chart round 1 at 'Hobbs Cross' borrowing a Classic Hot Rod - heat - 2nd of four drivers (31) - 5 points chart points. 27 March - Arena points chart round 2 and Gold Top Qualifying round 1 at 'Hobbs Cross' borrowing a Classic Hot Rod - heat - 2nd of five drivers (40) - 5 points chart and Gold Top Qualifying points. I was joint 3rd with one other driver in the Arena Gold Top Qualifying points. The 2019 season started with a mixed formula six round Winter Series with points from all races counting. The aim of the Series being to give new drivers a chance to race formulas they hadn't raced before and all drivers to race formulas at the new Hobbs Cross (HC) venue prior to the AGM and setting the 2019 fixture list. Round 1 on 16 January was due to feature two heats for Parmastox and two heats for Slotstox but due to a delayed start and availability (I lent out two), the Slotstox ended up being a single 'test' heat for those that hadn't raced or hadn't regularly raced Slotstox and so didn't count to the points. In the Parmastox for heat 1 I raced my blue Parmastox and scored 51 points and for heat 2 I raced my red Parmastox and scored 23 points - each heat consisting of four drivers. With 74 points I was top of the Arena Winter Series after round 1 by a 1 point. I missed rounds 2 and 3 at HC on 23 January and 30 January respectively due to illness plus round 4 at WACC as I was on a work training seminar in France. Round 5 on 13 February at HC featured Classic Hot Rods and Plastic Slotstox plus a bonus heat of Parma-Saloons. In the Classic Hot Rods heat I borrowed a Classic Hot Rod and scored 28 points; in the Plastic Slotstox I scored 17 points and in the Parma-Saloons I scored 11 points. A total at this round of 56 points meant an overall total of 130 points and I was down to 9th in the Arena Winter Series points. I missed the 6th and final round on 20 February at WACC due to holiday and finished 9th in the Arena Winter Series points with 130 points.